Long time, no write. You probably don’t remember, but I named the letters page of your Shockrockets series way back when (“Aftershocks”). Of course, I still follow Astro City faithfully, and have done so since its inception. Recently, I learned of a couple of news items, and would like to get some feedback from you. First, according to Comic Shop News, WildStorm will cease publishing all of its titles and essentially close shop by the end of this year. Since Astro City has been a WildStorm title for the longest time, I was wondering what this development holds for the publishing future of your fine series. Will it find a home at Image again (where it was originally published), or will it be welcomed into, say, the IDW house (also known for producing high quality material)? Or, will DC establish a line for creator-owned properties (a “Signature” line, essentially) to keep your series under their roof in one way or another? I remember, once upon a time, that DC expressed interest in publishing Astro City when it was still an Image title (well, by that point, a WildStorm/Homage book), but you resisted. They eventually fulfilled their wish when they acquired WildStorm from Jim Lee, and with it the Homage imprint, and thus Astro City by default. I realize that DC’s Vertigo label now exists to facilitate only creator-owned ventures, but Astro City seems to differ too greatly in tone and theme than the typical Vertigo title. It just wouldn’t fit in with the rest, don’t you think? Second, I was delighted to discover that Dynamite Entertainment will revive numerous Jack Kirby-owned properties and publish them under the title, Kirby: Genesis, which you are writing. Learning this exciting news led me to recall an unfinished “Kirbyverse” series produced by you and Keith Giffen called Victory, the first issue of which was published by Topps more than 15 years ago. As you know, the series was scheduled to run five (or six?) issues but didn’t progress beyond the first, unfortunately. But in just that single showing, Victory had displayed that it was clearly the best Kirbyverse title hitherto published by Topps, its quality easily surpassing that of its related publications. The story in Victory was also building a momentum that appeared very promising for not only the amusement of the readers, but for the Kirby franchise as well. I was utterly disappointed when nothing followed the first issue. Since you and Dynamite are now investing your energy in Kirby projects, will you and Keith finally get a chance to finish the work you started on Victory so long ago? I hope you can bring closure to this series. The fans deserve it! Thanks for taking the time to read this message and for addressing my questions. This inquiring mind thirsts for answers! DC did indeed make an offer to publish Astro City back when we went on hiatus at Image, and they made a very nice offer, too. We didn’t “resist” it so much as we wanted to talk to other publishers who’d made offers as well, and in the end, Jim Lee and Wildstorm/Homage simply made an offer that we liked better. DC’s offer was a good one, though, and since they bought Wildstorm, they’ve been terrifically supportive, so we’ve been quite happy there. And now, the end of Wildstorm doesn’t mean the end of all those publishing deals—it’s simply the end of an imprint, not the end of everything that had been published under that imprint. So Astro City will return later this year, as part of the DC imprint. And The Witchlands (formerly known as American Gothic) will be published alongside it. Plus, work slowly continues on the Arrowsmith novel, and when that’s done, it’ll come out from DC as well. It’s really not much of a change, as it turns out. Astro City is, as I write this, still being edited out of Wildstorm’s old La Jolla offices, by Kristy Quinn, who’s been working with us on the book for years. She just has a “DC” on her business cards now, instead of a “Wildstorm.” And when the La Jolla offices relocate up to Burbank, to join DC West, Kristy and Astro City will go right along. And just in case anyone’s wondering—no, being part of the DC imprint doesn’t mean we’ll be part of the DC Universe. Nobody in Astro City will be meeting Superman or joining the JLA, any more than Tarzan was part of the DCU way back when DC published that. I don’t think there’s going to be a formal “DC Signature” imprint, but there will be other DCbooks that aren’t part of the DCU. Stay tuned. As for Victory…well, good news and bad news on that front. The bad news is that, since we’re going back to the source for Kirby: Genesis, building on actual Kirby material and nothing else (much as we went back to Robert E. Howard’s Conan stories and left aside everything done by any other writer when I relaunched Conan at Dark Horse), we’re not using the Topps Kirbyverse material, even the stuff I wrote myself. The good news, though, is that certain story elements that were going to be in Victory have found their way into my outline for Genesis, so you’ll be seeing some of that story material nonetheless, albeit in a different way. And we’re making arrangements that’ll see my other Topps Kirby material, the Teenagents and Silver Star mini-series, live on in an interesting manner. That’ll take a while to happen, but I’m excited about it, so I’ll be making noise about it just as soon as I can. Meanwhile, I’ve got to hunker down and get all this stuff done, so it can return (or debut) without too much more delay! Is there any likelihood of Astro City Visitor’s Guide being reproduced in a compilation anytime? I thought it’d be put in a compilation of one-shots, but that recent solicitation doesn’t seem to include it, which I think is a shame, as it’d be a wonderful opener. A while ago I read Superman: Secret Identity, and I thought it was pretty amazing. It’s one of those books that I find myself constantly recommending to people. Do you know if DC has any plans to reprint it? I’d love to own a copy. Very glad you liked it, Steven, and I wish it was still in print myself. I’m assuming DC will reissue it when we’re ready to bring out Batman: Creature of the Night, its thematic sequel, in order to take advantage of promoting the new series. But I can’t say for sure. As a former Iron Man writer, do you think this concept could be expanded into a full-blown comic? Or am I being too enthusiastic about it? I think that’s a pretty sweet design, and could make for a very enjoyable “Elsewords” style project. For readers who don’t know where it’s from, it’s the “Iron Man By Design” alternate cover to Punisher #16, of all things, and it’s by Dave Taylor. His blog post on the piece can be found here. 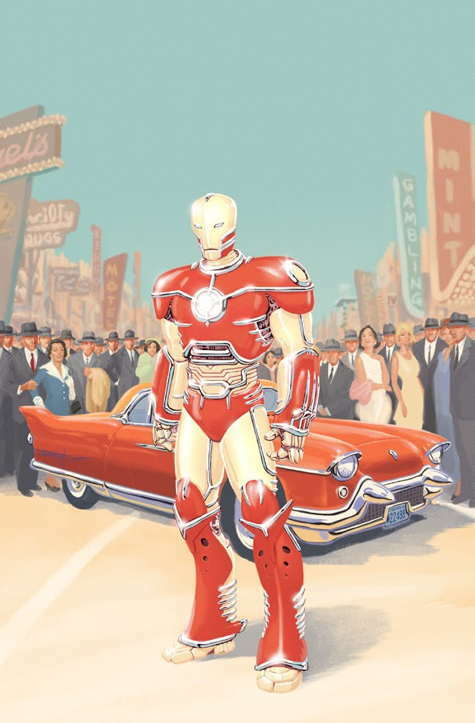 Hook up Dave on art with David Michelinie, Chuck Dixon, Mike Baron or someone else who could do a snappy late-Fifties/early-Sixties Vegas “Rat Pack” take on Iron Man, and you’d have something well worth doing. I’d buy it! Do you want to mention—and/or link to—Panels for Primates, an ongoing charity anthology on ACT-I-VATE)? Creators like Stuart Moore, Rick Geary, and David Petersen are contributing good primate comics for a good primate cause. 38 all-new pages and counting. Updates every Wednesday. The first story (by Stuart Moore and Rick Geary) is here. And the most recent story is here. A weekly charity anthology called Panels for Primates debuted on ACT-I-VATE in October, featuring primate comics by different creators every Wednesday, all to benefit the Primate Rescue Center in Nicholasville, KY. Stuart Moore, Rick Geary, Rahsan Ekedal, and David Petersen are among the top-notch creators already featured, with talent like Mike Carey, Roger Stern, and Carla Speed McNeil in the pipeline for the future. Readers can view the ever-growing archive of primate stories for free, and are encouraged to swing over to the Primate Rescue Center and donate whatever they can. They should specify that their donations are Panels for Primates donations; otherwise, the talented creators involved won’t get credit for the funds raised. If readers use the yellow PayPal button (instead of the Donate Online one), they can donate very small amounts using their credit cards. The anthology will run until at least April, and will contain between 80-100 pages in total. • providing sanctuary or referral to appropriate facilities. • working to end the trade of primates both in the United States and abroad. • educating the public to the plight of primates caught in the breeder/dealer cycle. • assisting researchers and zoo personnel in finding appropriate placement for surplus primates. • encouraging compliance with applicable local, state, and federal laws and animal welfare statutes. They currently provide lifetime care for 11 chimpanzees and over 40 monkeys. In addition to their website, the Primate Rescue Center also has a Facebook page. Panels for Primates is @panels4primates on Twitter. Happy to help spread the word, Troy! Some fun comics there—everyone go take a look! Hi Kurt. My name is Daniel and I’m from Spain so, in first place, sorry for my poor English. It’s a pleasure to speak with you, for me you are one of the best in the comics world. I’ll see you soon, in Barcelona, so I’m very excited about it. I’m 22 years old (in 2 days), and I’m studying Law and Economics Science at the same time, but recently I have decided that the only thing that I want to do is writing, I love it. So I’ve got some ideas in my mind: one sci-fi project, and another fantasy project that is a mix of The Dark Tower, Lost, Riverworld or Cárnivale, among others. In my opinion, both are good ideas (especially the sci-fi story). My problem is the next: I have read your great guide to create comics a lot of times but, yet, I don’t know how to develop and advance these ideas. I don’t know how to find new ideas. I don’t find new interesting concepts. In two words: I’m blocked. Could you help me, Kurt? Where do you find inspiration? What are the best places for me to find new ideas? I’m trying to find new ways to stimulate my mind, but it doesn’t works. All the ideas that comes to mind are the same repetitive ideas. Thanks a lot for your attention, Kurt. I suppose you are a very requested person, so I’m not so optimist about your response, but it would be very special for me. Thanks a lot again, Kurt. And good luck, you are a guide for me (Astro City is simply amazing). Thanks for the kind words, Daniel. Alas, I’m not sure what help I can be. I don’t have a system for coming up with ideas, not one I can teach at least. Coming up with ideas is just something that happens, for me—I’d have a hard time trying to stop it. I can forget the name of the place we’re going on a family drive and then misread the title of a movie, and before you know it, the combination of the two has me plotting out a novel-length story about a defunct resort hotel for retired gods in the clouds above a seaside fishing village. Part of it’s practice—I’ve been a professional writer for nearly thirty years now, and if you do anything over and over, it just comes easily after a while—and part of it’s just the way I think. There are lots of books for would-be writers, from serious, craft-oriented textbooks to light, inspirational volumes, and maybe you can look up a few of whatever they’ve got along those lines in Spain, and see if they do anything for you. My best recommendation there would be to hunt them up at a library, since books on writing are often useless (or might have only one or two ideas you’d find useful) so rather than spend a lot of money on them it’s best to read them first and then only buy the ones you know you’ll want to reread. The other thing to do is maybe not worry so much about having to come up with wonderful and new ideas, and just write about whatever ideas you can come up with, even if they strike you as old and hackneyed. The practice will help, and you might find yourself going in directions you hadn’t expected—as mentioned earlier, it’s not the brilliance of the idea that matters so much as what you do with it. And the more you practice, the easier ideas will come. Hi, what’s happening with Redhand? It’s a great story and lot of people are waiting for the next chapter. Alas, Redhand seems to be done, H. Or at least, I’m done with it. I’d contracted to do two volumes, and when they were finished, the publisher was interested in doing more, but the artist and I were both busy on other things, and couldn’t get the schedules to work out right. So the last I knew, we’d given the publisher our blessing in continuing the series with other people. But that was a couple of years ago at least, and I haven’t heard of anything in the works. I liked the idea of Windward Station (I originally called in Wayward Home, if you recall – a very different place I’m sure) and who populated it (true fanboy stuff there). Any chance of you writing more about it the next time you are writing more for DC (whenever that is but hopefully sooner rather than later)? Anything’s possible, Larry. But I’ve got no current plans in that direction, at least. I do want to take a bunch of my unused ideas for Aquaman: Sword of Atlantis and rework them around a new character someday, since I still like the prospect of doing underwater heroic fantasy. And I do still like the idea of an ocean-going Victorian mansion, but I suspect I’d probably have to make up a new one (“Leeward House”? “Winedark Manor”?) and do something with the idea in a very different context. I’ll be attending the Emerald City Comicon here in Seattle this upcoming March, and I’m excited to see you’ll be there as well. This is my first comicon and I was wondering what your policy is regarding autographs. Do you charge for signatures? If so, how much do you charge? Is there a limit on the number of items you’ll sign? I just searched through my comics collection and found exactly a dozen comics you’ve written (well, 10 comics, a trade paperback and a hardcover), is that too many? I don’t charge for signatures, R.C., and while I understand why some writers have a limit on the number of things they’ll sign, I’ve never really felt the need, at least not so far. If someone’s got a huge stack of stuff to sign, I might sign a portion of them and then ask him to go back to the end of the line, so anyone waiting behind him doesn’t have to wait an unreasonable amount of time, but if he’s willing to keep coming back, I’m willing to keep signing. I’m there to talk to readers, after all, so I’m happy to sign and chat all day, within reason. And a dozen items is just fine. See you there! Hi there! I’m wondering (based on now-conflicting evidence) if you are no longer planning on visiting the Stumptown Comics Fest in Portland this coming April. At one point you were listed as a guest, but I don’t see you mentioning it! I was scheduled to attend, Patrick, but I had to back out—it turned out there was a conflict, and that weekend I’ll be far from the Portland area, attending a comicon in Barcelona with Brent Anderson. But the Stumptown crew were very gracious about it, and since I’m local to Portland, I’ll definitely be there next year! That catches me up on most of the mail, and this is becoming a pretty long column. So I’ll polish off the last couple of to-do items later. And hopefully, I won’t neglect the blog for this long a period again! This entry was posted in Mail and tagged aquaman, astro city, charity, ideas, iron man, kirby: genesis, panels for primates, redhand, secret invasion, signings, stumptown, superman: secret identity, wildstorm, windward by Kurt Busiek. Bookmark the permalink.